I am in the middle of a Block of the Month at Quilters Common in Wakefield, MA. Antoinette is offering 3 colorways: Blues, Brights, and Traditional. I love reproduction fabrics, so I went with the traditional colorway, but I am also digging into my stash and making a set of blocks with my modern/contemporary fabrics. This is what I have so far. I have set up both colorways side by side on my design wall with the setting squares for a comparison. For those folks who think traditional/reproduction is all browns and boring … guess what … it is not!! Old quilts are often brown because the dye in the fabrics has faded. The reproduction fabrics have brought back all the glorious colors that were in your great great (great?) grandmother’s quilts when they were new and they compare quite well with the modern fabrics. Both quilts will be full of color. 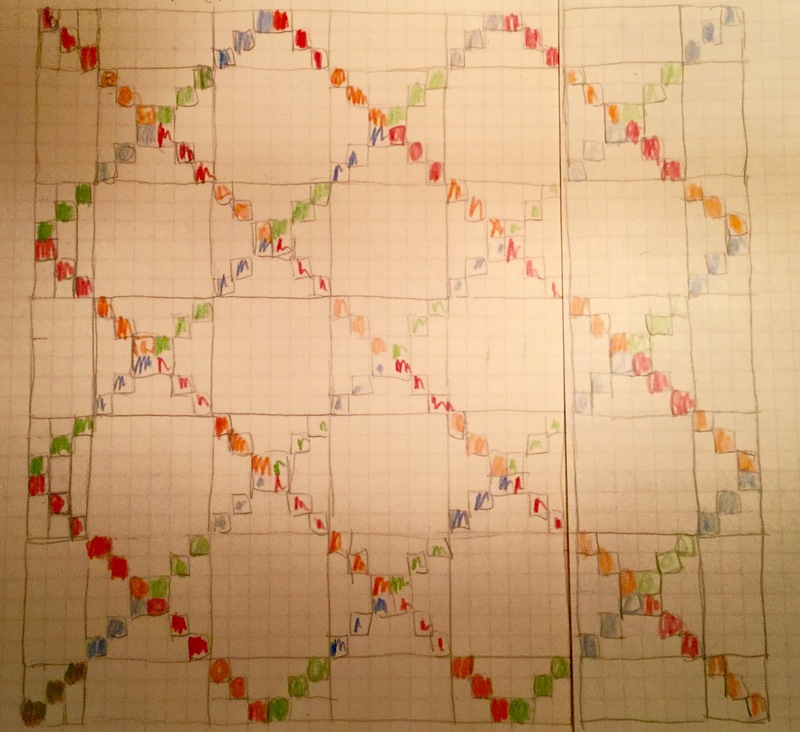 My plan for both quilts is to use half blocks for an inner border and also a 9″ outer border. 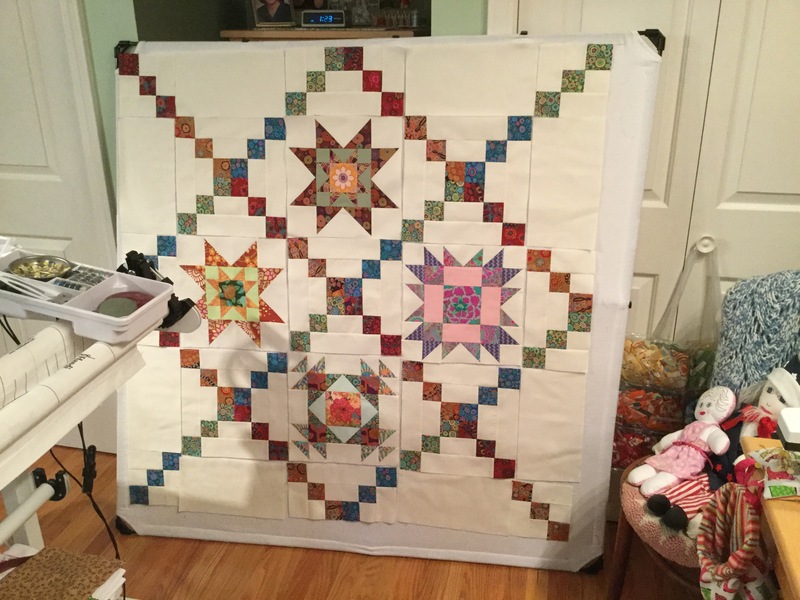 The finished quilts will be 90″ x 90″. Here is a 48″ x 48″ portion of what the tops will look like. Notice two of the star blocks are the same pattern? I did not like the first one, so I made a second one. The top one will go in the quilt. The other may end up on the back of the quilt. These will be WIPs for quite a few more months, but I’m glad I got a head start on the setting blocks! This entry was posted in Quilts and tagged block of the month, modern quilt, Quilters Common, reproduction quilt on December 18, 2015 by pmegio. I have a soft spot in my heart for reproduction fabrics and patterns. 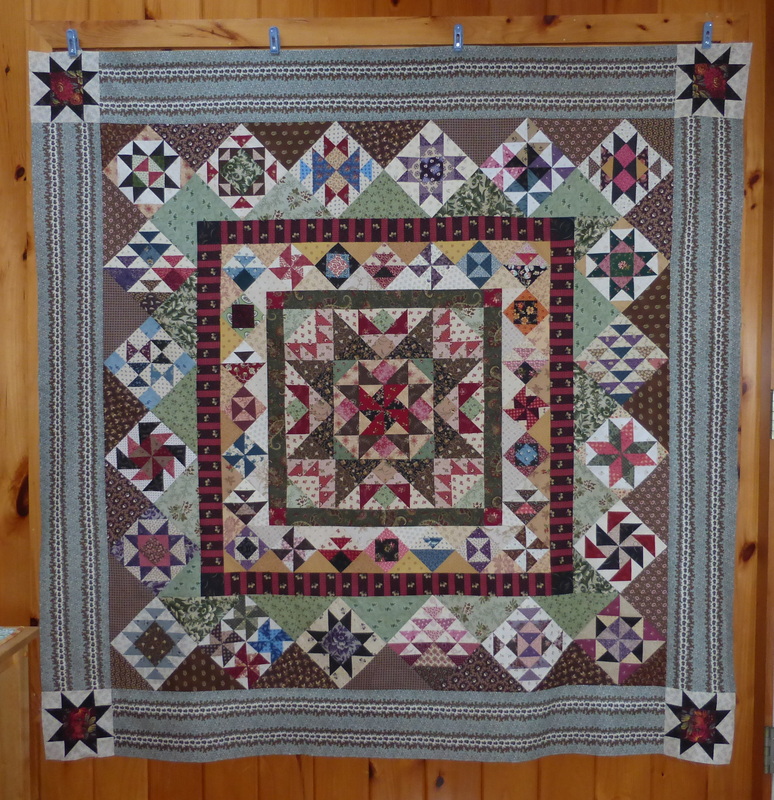 I love old quilts and enjoy reading about them and have a few old tops that I treasure. I could not resist Collette’s block of the month at Quilter’s Common for this pattern. I got a bit behind on finishing it but here is the top ready for quilting. I was inspired by Collette to add the striped border. I love how the Green jumps out now. The picture before the outer blocks and border were added highlights the reds. My blue/green border gives it another look altogether. Piecing this top was a bit of a challenge and I feel that I have really improved my skills quite a bit. So, I am glad I spent the time to fuss with all of these blocks. And now it is Quilted! 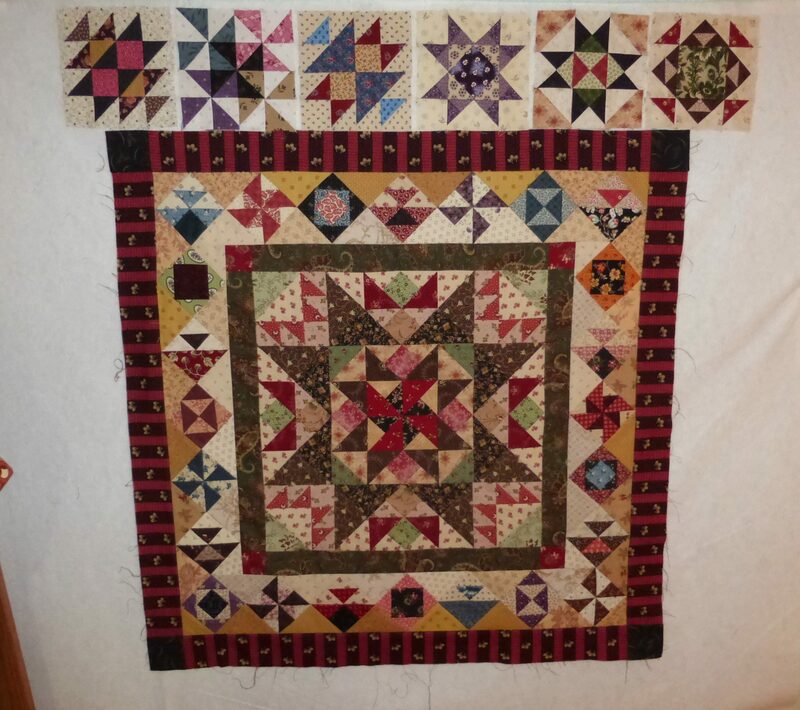 This entry was posted in Patterns, Quilts and tagged antique quilts, aunt lucy, block of the month, medallion quilt, Quilters Common, reproduction fabric on April 24, 2014 by pmegio. I have made some progress on two quilts in the last week or so. I finished my Midnight in Bali quilt top and have quilted it. I used an edge to edge pantograph called Big Leaf which I think suits the batik fabrics. I have taken photos of it, but I must admit that I still have not attached the binding! I promise I will finish this quilt! I have the binding cut out, but wanted to get outside and take photos in the snow before it melts … it is Spring, the snow must melt! 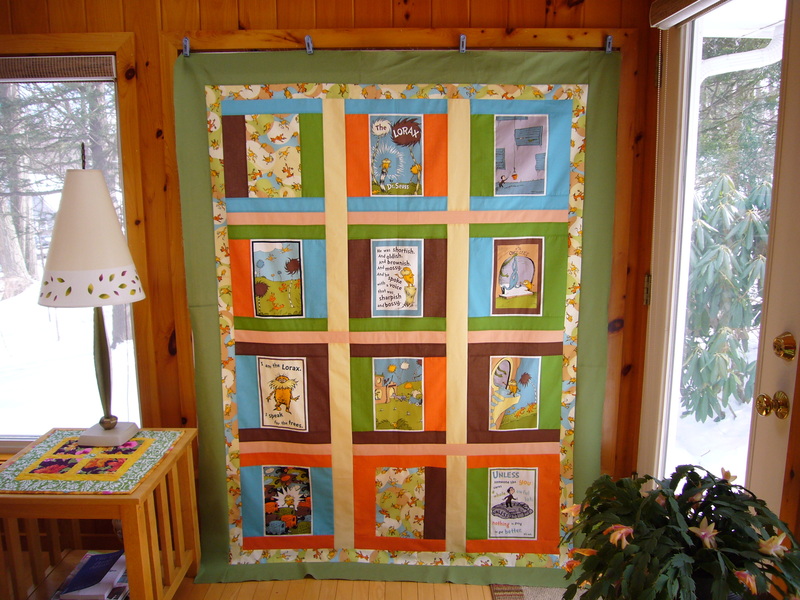 I also put a quilt top together with the Lorax panel. It might be a bit too abstract? But, I do like it. I have a perfect panto for this one, too. It is called Zephyr, but it reminds me of the Truffula trees! This entry was posted in Quilts and tagged batik, block of the month, Dr Seuss, lorax, pantograph, quilt top, truffula on March 22, 2013 by pmegio.